150 years to reach 2 C warming is that scary? It depends. If positive feedback effects dominate, the rate of rise will accelerate. In any case, the warming will continue for hundreds of years into the future before it reverses. Based on what! A homemade graph from Bob Tisdale a contributor to Watts but not a real scientist. That's not to reach 2 C of warming, that's to reach 3 C of warming, because we have already warmed about a degree. 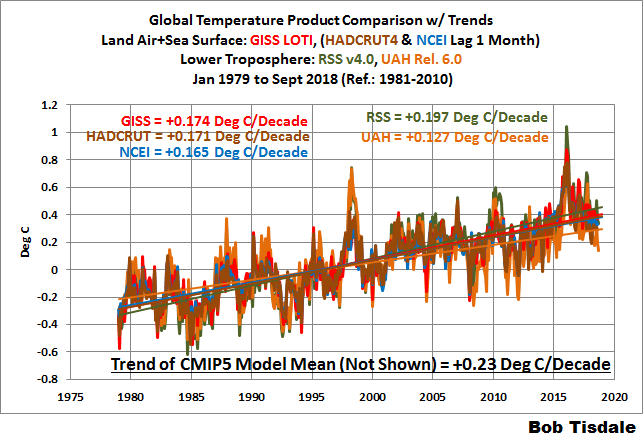 To reach 2 C at 0.13 C/decade the 2C value would be reached in (2-1)/0.13 = 7.7 decades or 77 years. Did you really not understand what the IPCC was saying? The prjected time for 1.5 C above preindustrial levels is closer to 2030. You shouldn't forget that we have already warmed Earth by close to 1C.